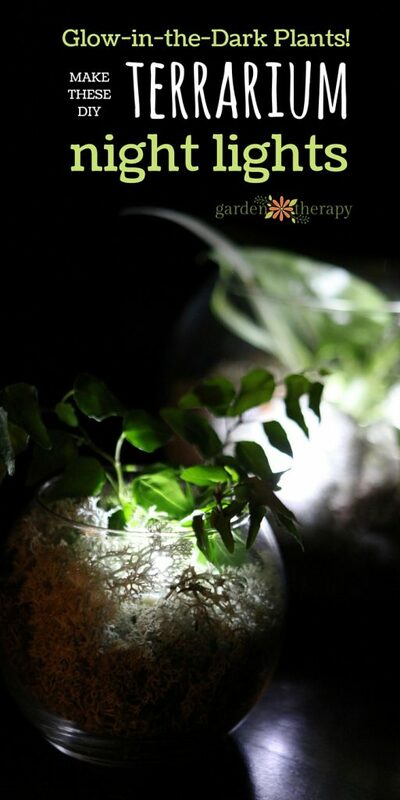 Terrarium by day, mystical glowing orb by night, this terrarium nightlight has a special twist: it lights up the evening! For those of us who prefer to sleep with a little glow, this unique nightlight gives off just enough light so that you don’t stub your toe on the furniture during late-night washroom trips. 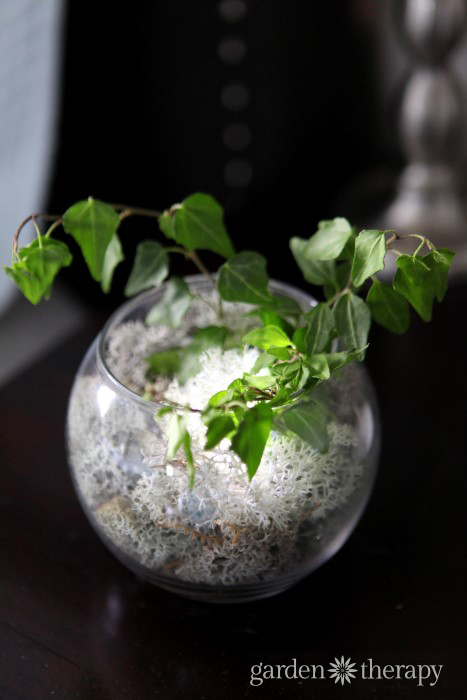 The terrarium is simple to make and care for, and all you need is four materials. “But why would the plants need light at night?”, you ask. They don’t, the light in this terrarium is just for you. Being just a nightlight, it is not enough that it will cause the plants any harm. Gather materials for this project from a garden center or florist shop. Any glass vase or bowl will work well, but I like the look of these round, fishbowl-shaped glass terrariums. Reindeer moss comes in a rainbow of colors, so choose one that compliments your room. Small tropical indoor plants make the best choices for terrariums in rooms with lower light levels. 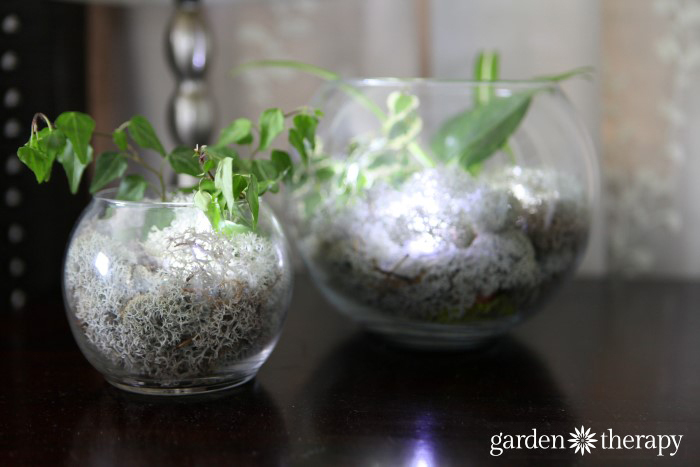 You could also use air plants in a room that is bright during the day. 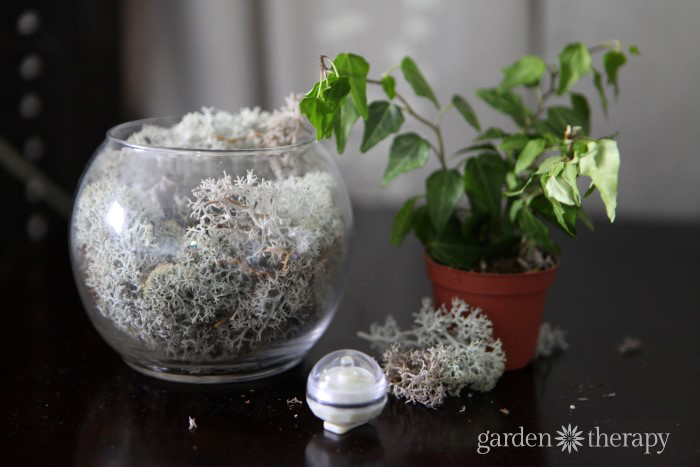 Create a nest out of reindeer moss in glass bowl. Make a little room for the plant to nestle in (in its pot). 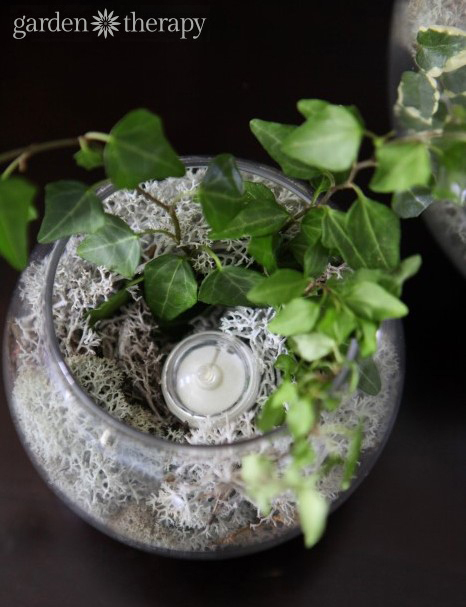 Adjust the moss to cover the pot from all sides. Look for a waterproof LED light for your terrarium. You can find some here. 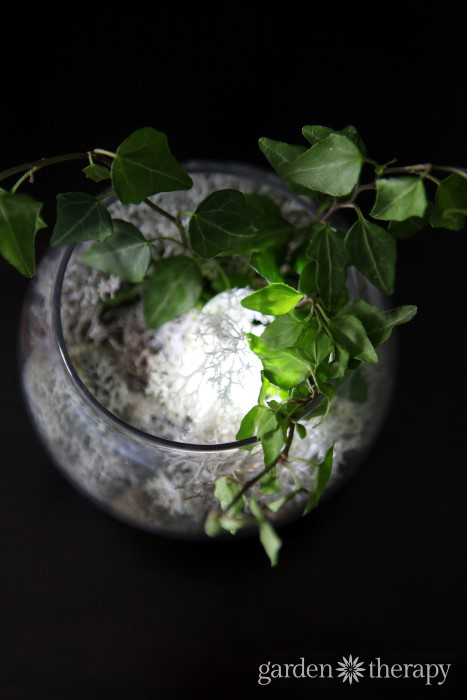 Set the light in the terrarium and cover the top with a bit of moss, enough so that it dims the light slightly but also hides it during the day. This light twists on and off so you can easily choose the setting. 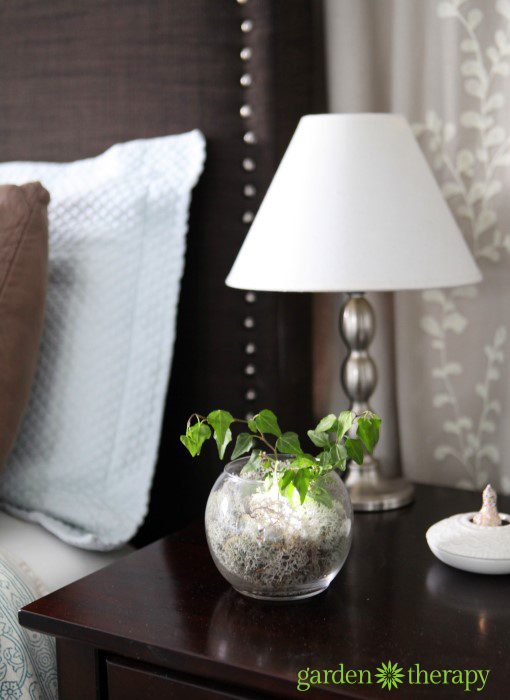 You could also look for lights on a timer if you wanted to use the light while falling asleep only. 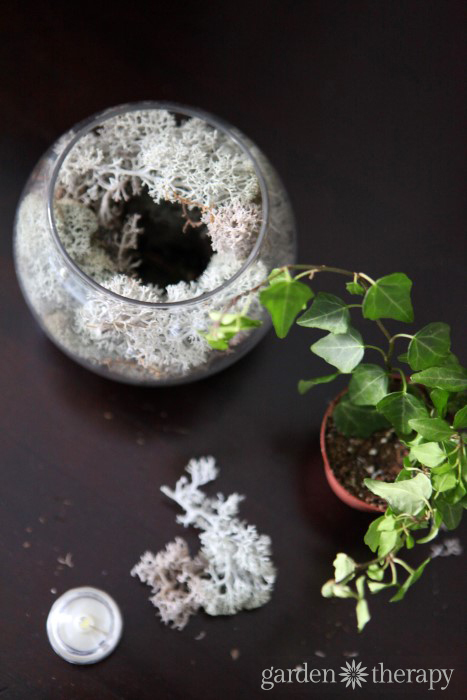 Set the terrarium where you plan to use it and water plants regularly when dry. The small pots will quickly become too small, so repot the plants as they grow bigger and require more space for the roots. Interesting idea! Never seen one before. Only knew to make terrarium for table centerpiece but adding light has given it a unique look. Thanks for sharing. How innovative! 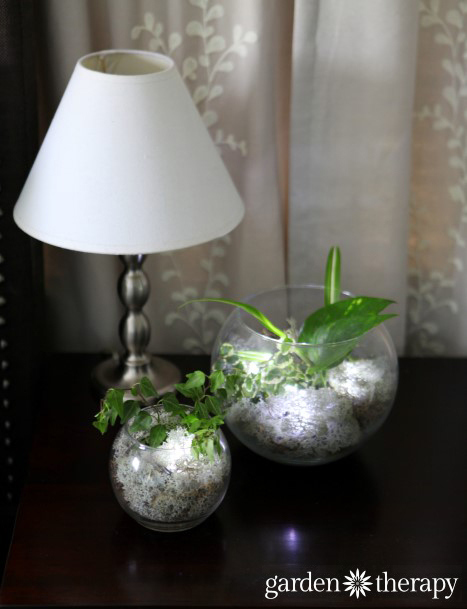 Terrariums are great in general but to serve as a night light is not something I would have thought of trying! It is inconspicuous and looks fabulous as well! Thanks for posting! This is adorable! My daughter will love helping to make couple for her new flower themed bedroom. Love the idea. Yet, do the waterproof LED lights have batteries that require changing? Hi Rachel, yes they do BUT they use so little energy that they don’t need to be changed often. I’ve had mine for years and they have not needed changing yet.